Uncaged Ergonomics Maker Joseph Send first made an ergonomic textbook holder before focusing on desks. His easy-up and easy-down designs make standing up while working as easy as, well, standing up. A springed mechanism lets these adjustable desks pop up (and back down) in seconds and remain stable. 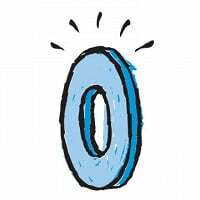 That, along with their small footprints, means you can reap those standing health benefits without sacrificing work space. There’s room for workday essentials on the surface and multiple height levels to get into the perfect working position. When Joseph streamlined out the bulk some other standing desks have, he also eliminated the need for installation. Just set a desk on top of your work space and get to it. Will the standing desk fit on top of my desk? 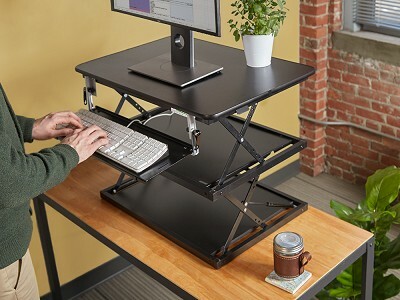 The standing desk requires a surface of at least 18" x 25.2" in order to fit safely. What heights can I adjust the desks to? 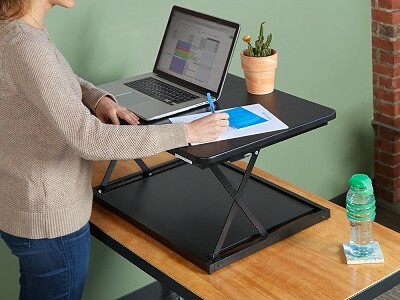 The single-level desk has four height options: 3”, 6”, 10”, and 14”. 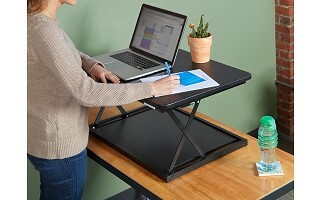 The multi-level desk has five height options: 4.1”, 10”, 15.4”, 18.75”, and 21.25”. Why is a middle shelf included on the multi-level desk? The middle shelf adds stability and is a great place to put documents and other desk items when standing. All items should be removed from the middle and lower shelves before lowering the desk.